I love ice cream. I love pizza. I love caramel. I love bacon. I love raspberries. I love Texas toast and Macaroni & Cheese. If I took all of these things that I love and put them into a blender, I doubt I would actually like what came out the other side. Massive Damage’s Star Renegades manages to take all of those ingredients that we like and combine them into what could end up being a very nice cake. I was trying to think of a good analogy for how to explain the game’s mix of sci-fi and gaming genres, and that’s what I came up with. Sorry. The game is a unique blend of several types of experiences that probably shouldn’t work together, but somehow they do. It has some JRPG elements, tactical planning, rogue-like adventuring, and even some Advance Wars and Fire Emblem thrown in for good measure, and makes it all somehow work. 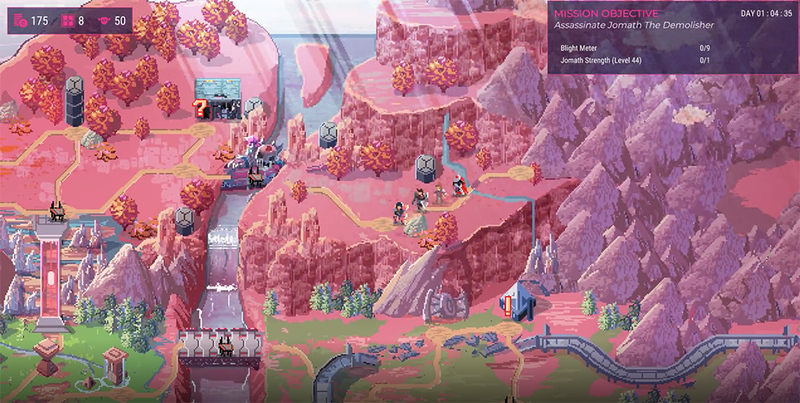 Star Renegades, at its most basic explanation, is a turn-based game in which we explore an overworld map to halt the advancement of an enemy force. But this is really just the top layer of the onion. Underneath, it draws inspiration from a lot of games and genres, and pushes us to approach it much differently than we would a typical RPG experience. As we travel across the overworld from point to point with our squad, we can come across battles or mini-missions, alternate paths or bosses. How we pass these obstacles affects our play experience down the line, as our actions have very quick consequences. If we go one way on the map, for instance, we get caught up in a battle that may be slightly overpowered but gets us along further. If we opt to take a side path, we have to shut down a giant cannon that blocks our way, affecting our available actions on the map. This continues in a loop that could last for as little as 2 hours or as long as… well, as long as it takes to get to the other side. We can even form relationships along the way, building up our camaraderie with our squadron and even having progeny of our own that will join our battles in later loops. And while this 2-hour loop might seem fast, just 15 minutes in a demo had me advance far on the map, and feels like it packs a lot into a small space. It’s much more flushed out than I could have imagined. The battles themselves are the highlight, I think. They’re turn-based, sure, but they also have some Final Fantasy active time battle elements, focusing on a visible timeline that shows who is making a move next. It’s a nice level of transparency in the combat that lets us keep our pace steady so that we don’t use up our powerful moves too early. Characters have unique fighting styles, some of which even affect how we view the screen in front of us. One of the squad members utilizes a close-proximity melee attack that zooms the viewpoint in to a close-up shot of the character and intended enemy as he unleashes his attack, clearing out the rest of the HUD and blurring and shifting the backgrounds. It reminds me of special moves in Dragonball Z, putting the entire focus of a scene onto the back of one move. Its use of combos (and combo breakers), counters and timed attacks add considerable depth to traditional turn-based play. The battles have a lot built into them, and might feel complex from an initial glance, but it’s relatively easy to juggle all of the different concepts together, keeping the action fluid and at the speed a nice pace that we set. 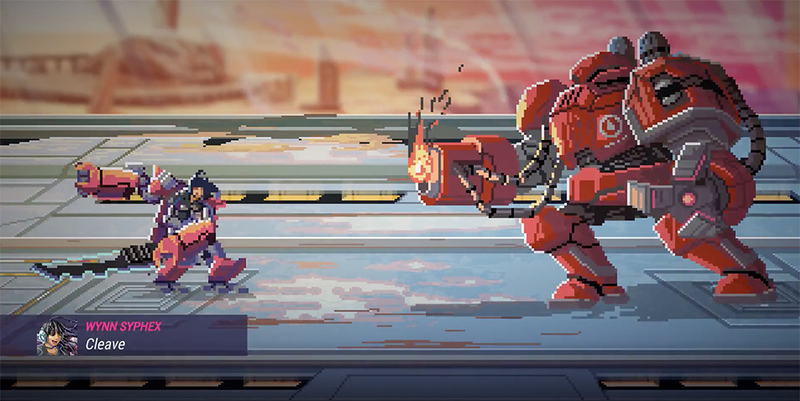 The pixelated visuals have a 32-bit style to them, mixing aspects of Star Wars and Mass Effect and cyberpunk and steampunk and mechs all together to create a gorgeous combination. It’s “pretty,” but I hate using that word since it doesn’t always go well with giant mechs. 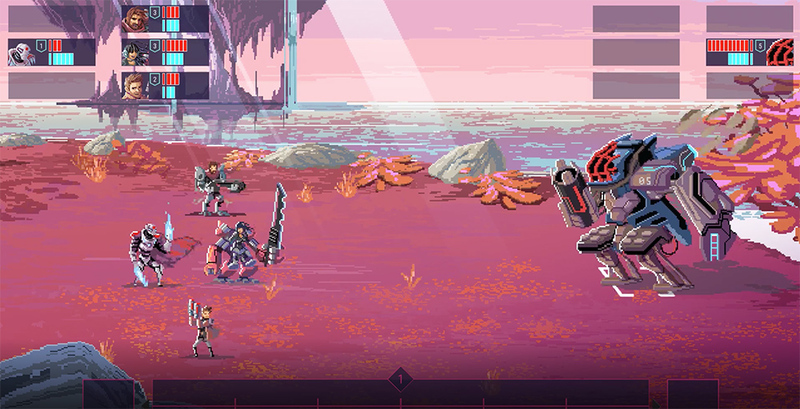 Star Renegades has a lot that it is trying to do, but if the demo is any indication then it could end up being way more than the sum of its parts. Look for it in early 2020.